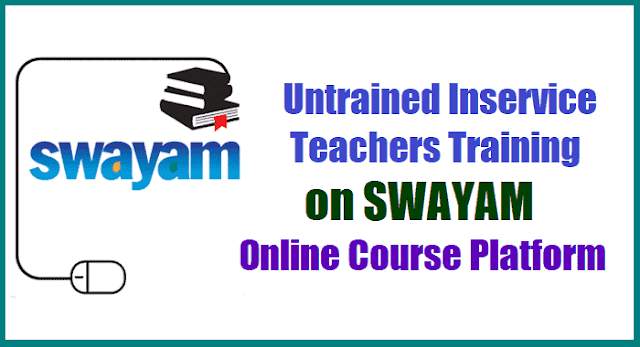 UnTrained Inservice Teachers Training on SWAYAM Online Course Platform. NIOS UnTrained Teachers Training on SWAYAM Platform, Training of Untrained inservice elementary teachers. Training of UnTrained Teachers in the State of Telangana. Awareness on 'SWAYAM' Platform to the un-trained teachers confirmed their admission. C and DSE Telangana - Proc.Rc.No.4141, Dated:06-11-2017 :: Sub: SCERT, Telangana - NIOS -Training of Un-Trained Teachers in the State of Telangana. Awareness on `SWAYAM' Platform to the un-trained teachers confirmed their admission - Orientation meeting on 8th Nov, 2017 registering for 'SWAYAM' Platform - Reg. 2. Additional Secretary (TE), MHRD, New Delhi, D.O. Lr.No : 8-1/2015-Tel., dt:31-10-2017. 3. This office Ir.no.even, dt:28-10-2017. 4. Video conference of MHRD on 03-11-2018 at 4.30 PM. All the Regional Joint Directors of School Education / District Educational Officers and MEOs in the State are informed vide ref. 1 to 4 the un-trained teachers working in recognized schools are to register themselves for the 'SWAYAM' Platform and participate in the online course. It is once again reiterated that it is the personal responsibility of the MEOs and DEOs to verify the eligibility of the candidates and confirming their registration on `SWAYAM' Portal. The confirmed un-trained teachers registered for D.EI.Ed. Distance programme are to be oriented through a District/Mandal level meeting on 08-11-2017. There by, all of them are guided and get registered for the 'SWAYAM' Platform. In this connection, the teachers whose enrolment is confirmed, and verified by MEO / DEO, are to be oriented on `SWAYAM' Platform. For this, the teachers may be called to the district head quarters on 08-11-2017 so as to make them acquainted with the 'SWAYAM' portal and guide them for registering on 'SWAYAM' and once registere they can download the course material. C and DSE Telangana - Proc.Rc.No.4141/SCERT/TS/2017, Dated: 03-11-2017. Sub :- SCERT, Telangana - NIOS - Training of Un-Trained Teachers in the State of Telangana. Awareness on 'SWAYAM' Platform to the un-trained teachers confirmed their admission - Reg. Ref : 1. National Institute of Open Schooling Secretary letter no : F90-1.47/2017/NIOS/Acad./TE, dt:31-08-2017. 2. Additional Secretary (TE), MHRD, New Delhi, D.O. Lr.No : 8-1/2015-Tel., dt:31-10-2017. 3. This office Ir.no.even, dt:28-10-2017. All the District Educational Officers and MEOs in the State are informed vide ref. 1 & 2 that the date is extended for the un-trained teachers working in recognized schools from 01-11-2017 to 07-11-2017. The process of matching / batching of un-trained teachers registered is going on in the districts / mandals. All the District Educational Officers are informed that it is the personal responsibility of the MEOs / DEOs in verifying the eligibility of candidates who have registered on the NIOS portal. In this connection, the teachers whose enrolment is confirmed, and verified by MEO / DEO, are to be oriented on 'SWAYAM' Platform. For this, the teachers may be called to the district head quarters so as to make them acquainted with the NIOS portal and guide them for registering on 'SWAYAM'. The District Educational Officers are requested to report compliance in this regard. The courses hosted on SWAYAM will be in 4 quadrants – (1) video lecture, (2) specially prepared reading material that can be downloaded/printed (3) self-assessment tests through tests and quizzes and (4) an online discussion forum for clearing the doubts. Steps have been taken to enrich the learning experience by using audio-video and multi-media and state of the art pedagogy / technology. In order to ensure best quality content are produced and delivered, seven National Coordinators have been appointed: They are NPTEL for engineering, UGC for post-graduation education, CEC for under-graduate education, NCERT & NIOS for school education, IGNOU for out of the school students and IIMB for management studies. The SWAYAM Android application is designed for students to consume all SWAYAM content anywhere, anytime and anywhere.